I absolutely love the neon trend, particularly for the Autumn/Winter season. Dark colours are usually associated with the darker evenings but there is nothing that I love than to brighten them up with a splash of colour. I got this neon green turtle neck sweater in River Island and I thought it was the perfect way to brighten up my faux fur gilet from the Versace for H&M collection. 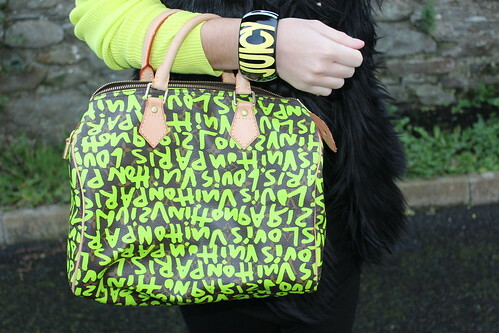 I added my graffiti “speedy” handbag from Louis Vuitton which was an ideal match! What trends have you embraced this winter? Gorgeous! You look so pretty and that lip colour is beautiful! I totally agree we usually think of dark colors once the weather gets cold but how fun is this look with neon?? Love it!! Very poppy look, neon neon neon! So colorful! I like fluo for winter!! I like this touch of color! Amazing neon touch… your look is very cool!!!! So nice to see neon in the cooler weather! Love the ay you styled it! Great vest too! Wow!! You look fantastic !!!! !